Invited by prof. Dimitris Charitos from the New Technologies Laboratory in Communication, Education and the Mass Media, Faculty of Communication and Mass Media, in the School of Economics and Political Sciences of the National and Kapodistrian University of Athens, we ran a three-day workshop in Athens as part of our research into Hackable Cities. Post graduate students from the “Communication environments in the physical and the digital world” course lead by Prof. Charitos and invited architects, artists and curators worked in four multidisciplinary groups to develop ‘hackable’ city making prototypes with regard to four different cases from the city of Athens. We started of with two presentations on our ideas on ‘hackable’ city making where Cristina Ampatzidou presented an outline of conditions necessary for ‘hackable’ cities and Martijn de Waal the design principles that define a hackable city making prototype. The first day was largely spend on research in the specific cases studies through interviews, desktop research and on site visits. During the second day the participants defined the exact issue they wanted to focus on and brainstormed on possible ways to address this issue, which were presented in short presentations. 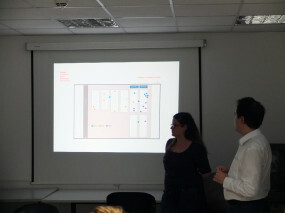 The last day was full on prototype development and design of the interfaces and the final presentations with invited guest critics. The four case studies covered a wide range of issues relating to Athens’ contemporary reality. Perhaps one of the most complex issues was the one concerning the Housing complex on Alexandras Str. A complex built in 1933 to house Greek immigrants arriving from Asia Minor, the eight buildings complex is a protected monument even though its physical condition is heavily deteriorated, largely because of severe damages during the Greek Civil War in the late ‘40s. With no other housing in its vicinity, the complex forms a neighborhood on its own. With a very high vacancy rate, some the apartments are inhabited by individual home owners, while others have long been occupied by homeless people, illegal immigrants, drug addicts and radical leftist groups. In this case, the main issue the group had to address, was not only the large amount of involved stakeholders but also the fact that these publics do not wish to come forward and desire to remain both hidden and segregated from each other. So creating trust while ensuring anonymity was key to their proposal. Drawing from examples such as [Im]possible Living and Launcht, the students aimed at creating a local web-based platform where the inhabitants could exchange skills with the specific aim of improving the physical conditions they inhabit. One could join without providing any personal information and report a problem in his building or an activity for which he would need help. 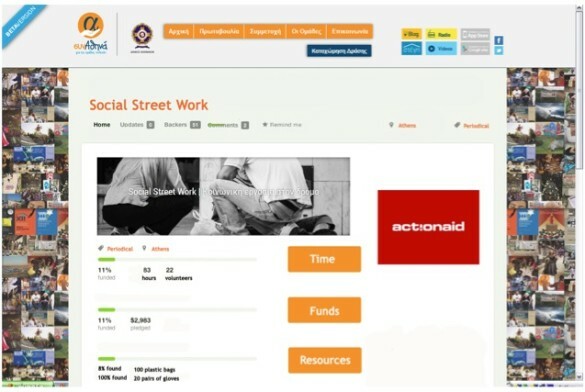 While access to the platform is only possible from within the premises to concentrate focus on the micro-environment of the complex, the reports and activities posted on it, can be visible from institutional stakeholders, such as NGOs, as well. From the presentation of the group, an interactive map concentrating offer and demand of activities and skills in the area. 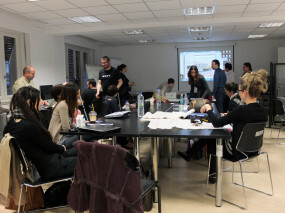 SynAthina is a platform, initiated by the Municipality of Athens to map and connect citizen’s initiatives in the city center. The platform is connected to a physical meeting point on Athinas Str. oppossite of Varvakeios Market, a space where citizens and creative groups can meet and work. In a very helpful interview with Anthi Christou, social media manager, content creator & community manager of SynAthina, we got to visit the space and get an insight on the workings of this effort. Less than a year old, SynAthina aims to facilitate citizen, creative and activist groups to find each other, collaborate and carry out their projects, by providing communication support, working space and connections to possible sponsors. There are many things to be improved but Mrs Christou is very happy that they can work around the bureaucracy that characterizes the public sector. SynAthina has plans to improve their mobile phone app and optimize the connection between initiatives and potential sponsors, enhance their online platform, run more calls for projects and open up more branches in other neighborhoods of the city. From the many inputs, the students decided to focus on automating the connection between creative groups, volunteers and sponsors. In for this to happen, there should be the possibility for people to register in the platform, not only as groups but as individuals or companies as well. When a group is organizing a project they can then request the support of volunteers in the form of their time or from sponsors in the form of resources or funds. A filtering system will help optimize the process for all the involved parties, a process that now takes places on a case-to-case basis and takes up a lot of time for the SynAthina people. Rethink Athens was a large architectural competition for the pedestrianization of Panepistimiou Str. one of the city’s main traffic arteries, which sparked a fierce debate on various issues, including its contribution to the gentrification of the city center, the unnecessary expenditure amidst the crisis, the role of private initiative in public issues, the lack of public debate prior to the announcement of the competition and the total exclusion of citizens, which was partly rectified by Reactivate Athens, a follow up project. The group working on this project wanted to create an interactive public debating tool that would not only address issues related to this particular case but that could be used for any current issue relating to a specific location. In order to achieve their goal, they designed a system that hacks a lamppost in order for it to act as a public debate indicator. Among their references is the Hello Lamp Post project in Bristol, where urban furniture talk to passers by by sending sms messages to their phones. Similarly, when there is an issue to be addressed in an urban area, the hacked lamppost reflects positive, negative or neutral reactions by the citizens. Arriving in the proximity of the hacked city light, the user can connect with it using her phone or tablet and then is being asked a question relating to the issue at stake, to which she can respond by either moving a slider or selecting a response. 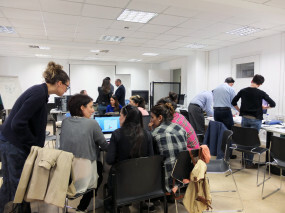 The students have paid particular attention to the website design summarizing the outcomes of all the questions asked and providing an overview of how perhaps the same issue has collected different reactions in different parts of the city. At the same time, thy would like to develop “Hack a City Light” as an open source package for other groups of citizens to put together and use in their own cities for their own local issues. The color of the light changes as an indicator of public opinion. 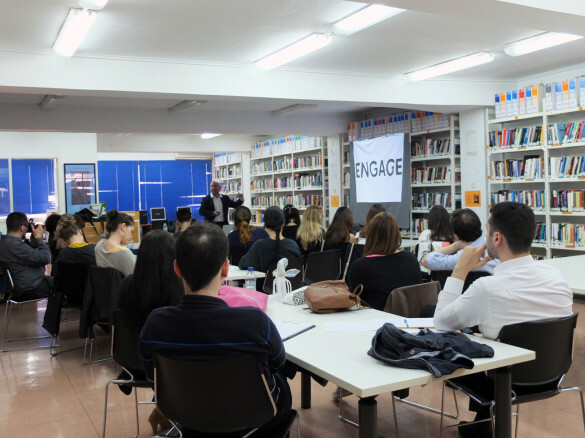 Last but not least, a group worked with the case of Embros Theater, a building that originally hosted the printing house of Embros newspaper, and was subsequently rented to director Tasos Mpantis to became the base of his theater group from 1989 till 2007. In 2011 the building, which is also a monument, was occupied and activated by the artist-activist group Kinisi Mavili with the support of the neighborhood association of Psyrri inhabitants. There are currently several cultural programs taking place in the building. The group proposed the restructuring of Embros website into an interactive online platform, where members of Embros would be able to organize themselves around specific tasks, while the Theater as a whole could enhance its public presence and attract new audiences. The current website or Embros Theater is only informative about the activities that take place there and does not manifest the collective effort behind its setup. As it appears from other similar examples across Europe, like Theatro Valle in Italy, the collective effort is very much externalized. Concerning the internal organization, the group used principles of sharing economies to propose a system of online distribution of tasks among the theater members. The use of the Athens Wireless Metropolitan Network allows users to share data many times faster and a lot safer, which could help people upload more visual material from performances, creating an online archive. Proposal for the re-organisation of Embros Theater website. All four groups had to deal with very complex issues and we are happy that they have managed to isolate and focus their efforts on well-defined problems within these cases. 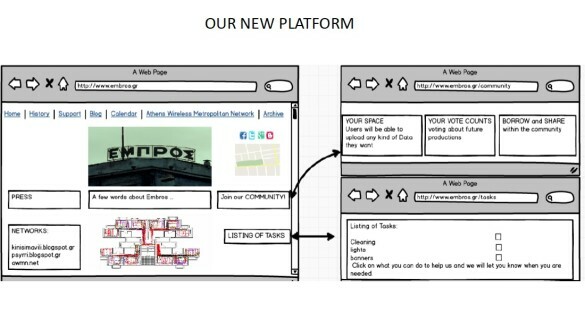 Each idea is making different use of digital media in order to achieve different results, some facilitating more openness and inclusion, like in the case of SynAthina and Hack a City Light and others optimizing processes that already take place informally like in the Embros Theater case. Also in terms of outcome the variety was significant: one hacking device, one hybrid object and two online platforms. Iouliani Theona, Architect, PhD Candidate at the National Technical University of Athens and Daphne Dragona, freelance curator, PhD candidate at the Department of Communication and Media Studies of the University of Athens were very kind to support the organization of the workshop.